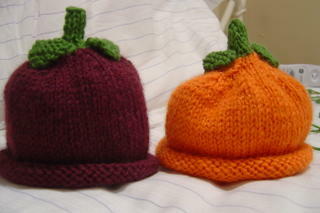 These hats are way cute for a baby gift and they are super simple to make. You can make Lemon, peach,apple, tomatoe strawberry, pumpkin, eggplant (or grape) just depends on what color you like. Then keep in stockinette until the stem is as long as you like. Continue in garter stitch increasing at each end of the next two rows (7 stitches). Work 5 rows, then decrease 1 stitch at each end for the next 2 rows (3 stitches). slip the next stitch to other needle, knit 2 together, and bind off. I love the Eggplant hat! (You don't see many of those.) I'll have to try that one. I just made an apple hat with your instructions. I'm not the best knitter, so they were perfect for me. Although if I make it again, I will knit a separate i-cord for the stem so it's not so chunky. I wanted a brown stem and green leaves and the brown stem turned out kinda looking like a turd. Oh well:) Babies look cute in anything! Thanks!!! kay i'm super new to all this so i apologize for my ignorance. first question, this is on round needles, right? I would do each of those for one row? like K 7, k 2 tog over and over until I get all the way around to the begining again? I was wondering the same thing as Misty. Thanks for sharing this super-cute pattern! I know this is a very old post, but I LOVE these hats! I've made several for gifts and people love them. I was wondering--would it be OK if I used this pattern to make a few of these hats to donate to the silent auction for the preschool where I work? I would just make them and donate them and the school would get the money from the auction. is this on circular needles?? ?